About the Hike: The Eagle Creek Trail is one of Oregon's most spectacular paths, passing half a dozen major waterfalls. The trail is also an engineering marvel. To maintain an easy grade through this rugged canyon, the builders blasted ledges out of sheer cliffs, bridged a colossal gorge and even chipped a tunnel through solid rock behind 120-foot Tunnel Falls. Difficulty: A moderate 4.2-mile hike to Punchbowl Falls (with 400 feet of elevation gain), or a difficult, 12-mile hike to Tunnel Falls (with 1,200 feet of elevation gain). Getting There: From Portland, take Interstate 84 to Eagle Creek exit 41, turn right and keep right along the creek for a mile to the road's end. Because the Eagle Creek exit is only accessible from the west, travelers from Hood River have to take Bonneville Dam exit 40 and double back on the freeway for a mile. The trail is so popular the parking lot fills by 10 am on sunny weekends, leaving latecomers to park half a mile away. Leave nothing of value in your car as break-ins are a problem at the trailhead. Fees: Recreation Fee Pass (Northwest Forest Pass) parking permits are required at the trailhead. They cost $5 per car per day or $30 per season. Hiking Tips: Although this is a great place to backpack, tenting along the first 7.5 miles is allowed only in four designated camp areas, where competition for weekend space is keen. Campfires are strongly discouraged. An additional caution to parents: trailside cliffs make this no place for unsupervised children. The trail starts along the creek but soon climbs well above it along a slope of cedars and mossy maples. Look for yellow monkeyflowers and curving fronds of maidenhair fern overhanging the path. After 0.8 mile the trail traverses a cliff with cables as handrails. At the 1.5-mile mark several short side trails to the right lead down to a viewpoint of 100-foot Metlako Falls in the distance. Continue on the main trail 0.3 mile to a ridge-end junction with the Lower Punchbowl Trail, a 0.2-mile side trail down to a broad, 15-foot falls with a bedrock bank suitable for sunbathing. 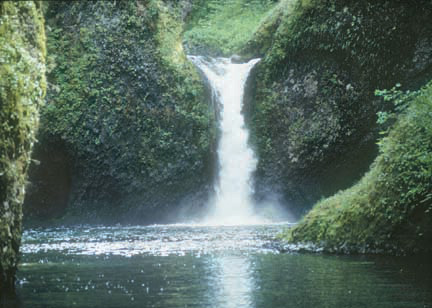 Hike upstream to a gravel beach to peer ahead to picturesque, 30-foot Punchbowl Falls in a huge, mossy rock bowl. If you're game for a longer hike, return to the Eagle Creek Trail and continue 1.2 miles to High Bridge, a metal footbridge across a dizzying, slot-like chasm. Here the creek has exposed a long crack in the earth - the fault along which this valley formed. For a nice lunch spot, continue 0.4 mile to Tenas Campground (on the right) and Skooknichuck Falls (on the left). For a still longer hike continue a couple miles further, duck behind Tunnel Falls, and 200 yards later gain a view ahead to the valley's last great, unnamed waterfall. A classic 2- to 3-day backpacking trip continues to Wahtum Lake. Snow closes this 26.8-mile loop from mid-November until June. Start by hiking up the Eagle Creek Trail 13.3 miles to Wahtum Lake. Then veer left on the Pacific Crest Trail for 6.3 miles to the Benson Plateau and turn left to descend the Ruckel Creek Trail back to your car. History: Built in the 1910s to accompany the opening of the Columbia River Highway, the Eagle Creek Trail was blasted out the cliffs with dynamite by Italian engineers. The area above the 800-foot-elevation mark was officially designated Wilderness in 1984. Geology: The many layers of columnar basalt exposed in the cliffs of Eagle Creek are all part of the massive lava outpourings that inundated 50,000 square miles of Eastern Washington, Eastern Oregon and Idaho to a depth of up to a mile 10 to 17 million years ago. These rock floods surged down the ancient Columbia River to the sea, pushing the river north to its present location.